Summer definitely settled in this week. Typical summer weather is a series of 3-5 days of hot sun with temperatures 88F (31C) to 95F (35C) and high humidity making it feel even warmer. Then we get a cool front from Canada and thunderstorms that keep you up at night or wake you up in the morning. Then we get a day or two of relief and the cycle starts all over again. In the wee hours Saturday morning we were treated to a light and sound show from Mother Nature and 2.5 inches (6.4cm) of rain in a couple hours. In the burbs south of the city they got 4-6 inches (10-15cm). It was good, the garden needed watering and the rain barrel needed to be topped off since we had been using it to water the garden during the heat of the week. Unfortunately all that water coming down hard and fast also served to knock over a bunch of plants I will now have to stake. That is if I get around to it. The heat and humidity make me lazy. Add that to the overabundance of mosquitoes –the most we’ve had in 10 years– and being outdoors is not so very fun right now. Earlier this week I learned that Minnesota has 51 different species of mosquitoes. I had no idea. I can’t say that when one lands on me I ever pay attention to what it looks like before I squash it. The one thing I can say is that they are all big which makes them easier to see and smoosh. are faster than we are. I walk by beds that need weeding badly and silently tell the weeds, “you’ve won…for now but just wait til it cools off!” But we’ve managed to do so much more mulching this year than ever before that in the scheme of things the weeds are no worse than usual and we have more garden beds than ever. We’ve also gotten far enough along in the season where we can start talking about what is working and what isn’t, what we want to grow next year and what wasn’t worth the effort. Next year for sure more spinach and lettuce and more varieties of lettuce. This year we only had one variety and it is good and still going strong, adding a few other kinds next year will be prettier and yummier. Peas. The sweet shelling peas that I thought the squirrels had all dug up but didn’t so I added even more are pretty much done producing in this heat. They did fabulously. We will be having some in a risotto with dinner tonight. Even more of these next year. Snow peas. They were good but not worth the effort. Much better to have the regular peas. Beans. Holy-moly, do we have beans. 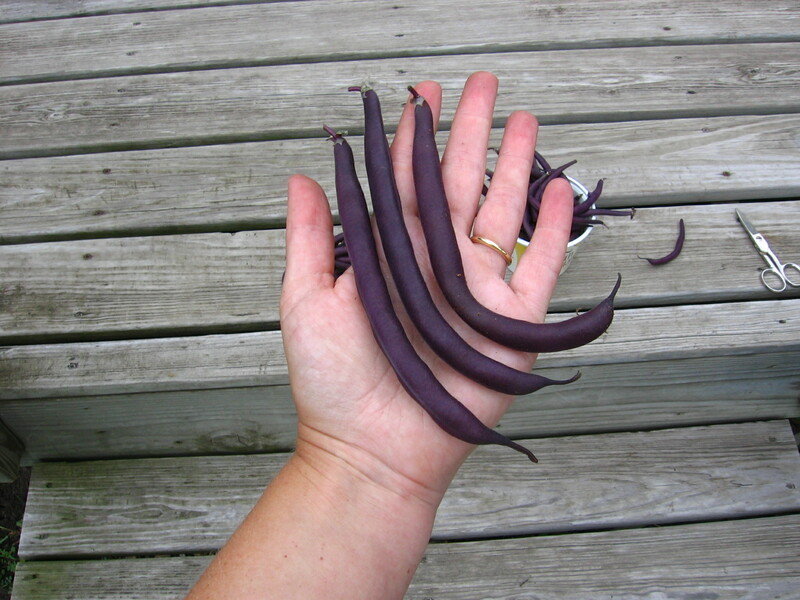 We have yellow and purple beans. Why grow green beans when that’s all you can get at the grocery store? Besides these are so very pretty and will look great in a spicy green bean dish we are going to try for the first time tonight. And they are huge too. And there are gobs more still in the garden and the plants are still flowering. When I was a kid we called green beans “string beans” because they are long like a string I guess. 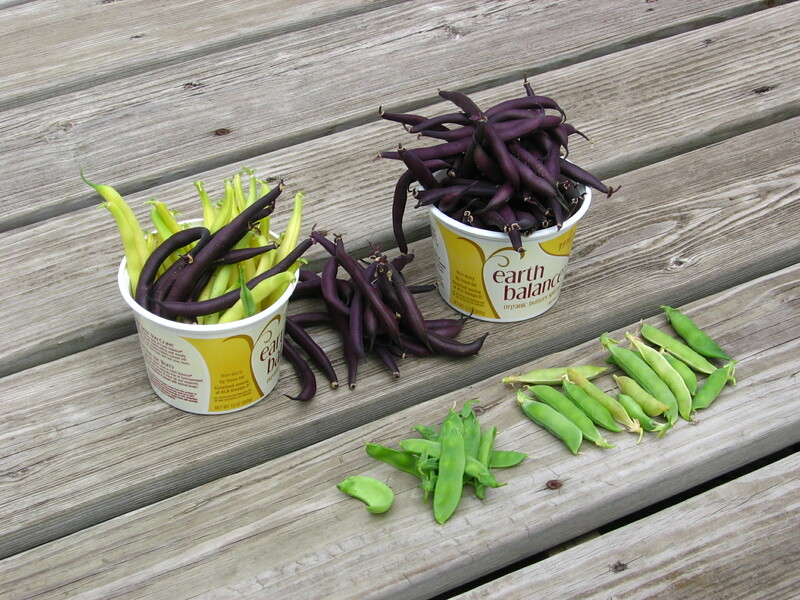 Definitely more of these string beans/not green green beans next year. starting to vine and flower and I am sure will have taken over the garden in a week or two. The beets are looking beet-y, the kohrabi is looking great and the bok choi is looking good too. The tomatoes and bell peppers, not so much. Not a good year for them, the heat took too long to get here and they are stunted. There is only one tomato on the three tomato plants. The peppers look like they are trying to recover though. We’ll see if they do. We haven’t had a chance to do any more work on our garden path but we have discovered while doing other things that it isn’t wide enough. We are glad we figured this out before we got it all done. Now we can widen what we have done and continue on from there. The coneflowers are starting to bloom. I love coneflower. I have a bed of almost all coneflowers. The photo I took is just the start. When they all get going I will take another photo. It is lily time too. 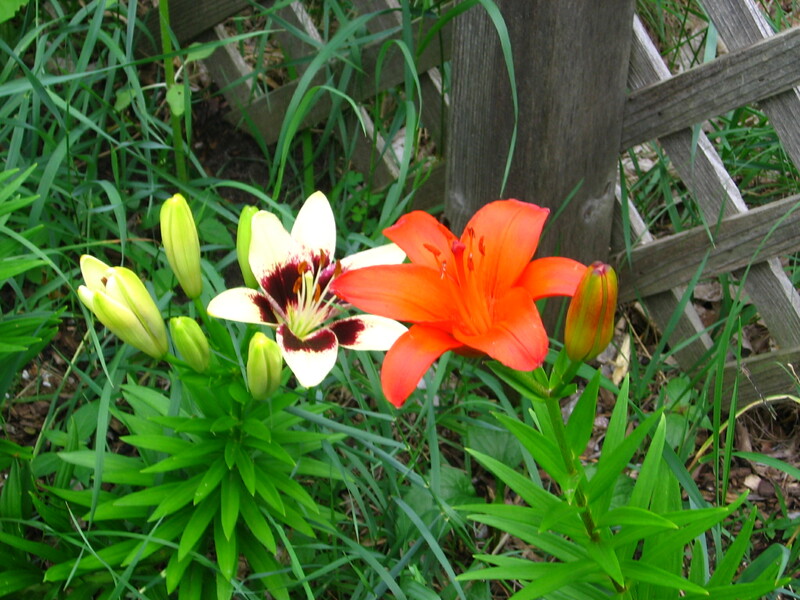 Daylilies and Asiatic lilies. 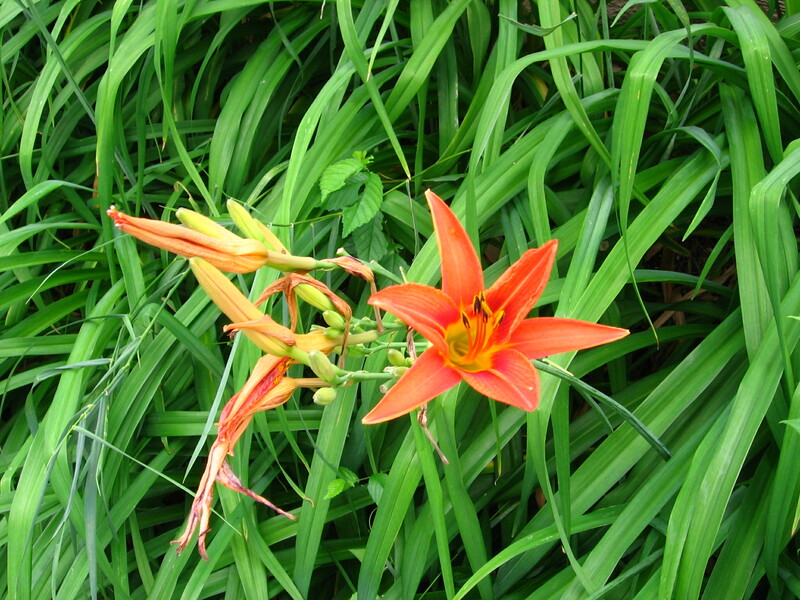 My daylilies are of the common orange kind but they are hardy and vigorous and pretty much indestructible. 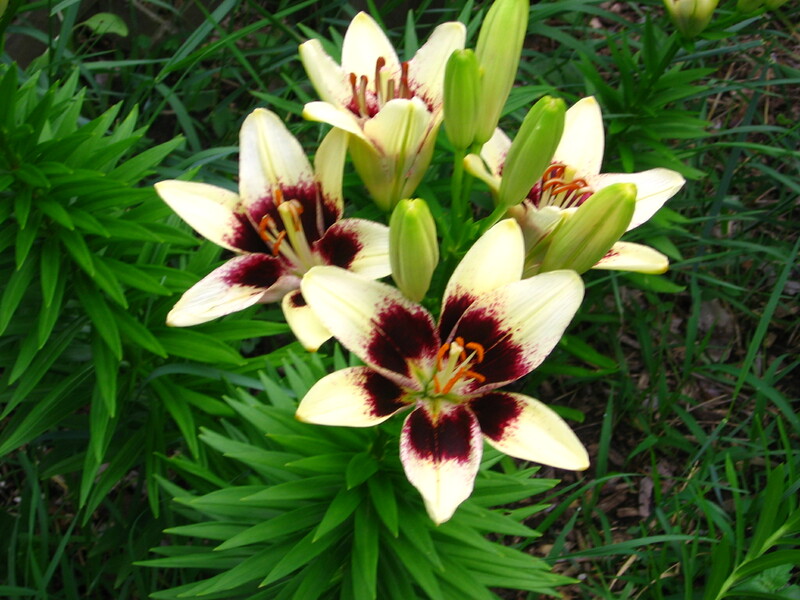 The Asiatic lilies are variety “tango.” We planted them about five years ago, three bulbs. That summer they did great. The next summer a rabbit came along when they were about three inches tall and ate them to the ground. Two recovered, the third did not. But we have had no further rabbit problems and the lilies have multiplied. This year one of the offspring has reverted to orange, which must have been this variety’s original color. It reminds me of when I had gladiolus. into the house and I finally had a garden of my own I had to have glads too. I ordered a bunch of different colors and oh, were they ever gorgeous. In fall I lifted the bulbs and stored them in the cool basement over winter since they are not hardy here. In spring I planted them out. After about three years of this all the variety of color had disappeared and every single one of them was orange even though orange was not among the colors I began with. I mentioned it to a gardening coworker at the time and she said that always happened to her too and every 3-4 years she has to order new bulbs. I was getting tired of the digging in fall, storing in winter, and replanting in spring regimen anyway so after that, I left the bulbs in the ground to freeze and haven’t grown glads since. And I don’t miss them. Now with the advent of this orange lily, I am worried all my tangos will eventually turn orange. Granted, it’s been five years and I only have one orange one so maybe I don’t have to worry. Besides, even if they do turn orange eventually it will be a couple decades at this rate so I suppose I’m ok.
Also blooming are some volunteer wildflowers. 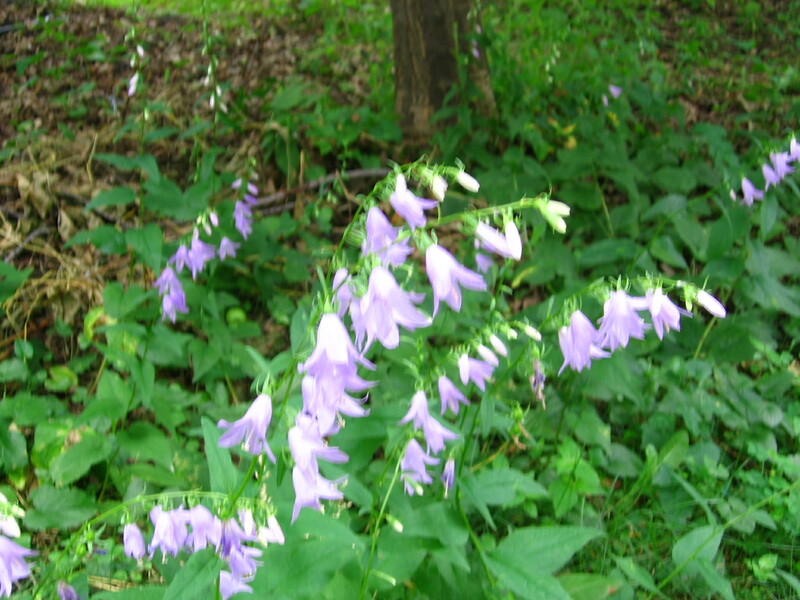 Under my apple trees in the front yard creeping bellflower has appeared (sorry the photo is blurry, the wind was blowing). It is not a native wildflower but it is pretty so I will let it grow. In the backyard in a flowerbed near the far fence is another volunteer, common milkweed. This is a native flower and somehow I have a lot of it popping up. I am letting it grow and hope it spreads. It is a host plant for monarch butterflies and very pretty to boot. I did not take a photo because the one that is in full bloom at the moment got knocked over in the deluge yesterday. However, there are several others that haven’t flowered yet so hopefully I will get a photo of one of them. making me lazy, but I seem to have strained my thumbs. I know, weird, right. It is not a gardening injury but rather a library one that has happened from shelving books. I should know better than to grab too many heavy law books in one hand at a time, especially since I have strained my thumbs before, but I seem to be a slow learner. Anyway, it is remarkable how much I need to use my thumbs and how slow it is to type when I can’t (though I keep forgetting and then regret it). Hopefully, with rest and limited use, they will be better by this time next week. Between my thumbs and the summer lazies I will do my best, but I thought I had better say something just in case. Great garden report! Sorry to hear about your thumbs. I had no idea there were such occupational hazards in a library. I had to laugh at the Earth Balance containers. They are quite convenient, no? 😀 And it’s true, good paths are very important for happy gardening. I’d be working on mine right now but I ran out of pea gravel. Enjoy the rest of the summer! Sylvia, thanks! It seems to happen every few summers. We don’t have student workers during the summer so I have to reshelve books and we are working on a big move between floor and then a shift after that is done and all that grasping adds up. Ha! We save our Earth Balance containers and use them until they break because they are indeed so convenient. We buy bulk peanut and almond butter and they are the perfect size for that, among other things 🙂 Oh, pea gravel for your garden path? Very fancy! Firstly, I love that synonym for insect-murder…… “smoosh”. When I moved to Ontario, I remember seeing at a gas station a postcard that had a mosquito with a saddle on it — emphasizing how big the Ontario bugs were…… yet, I rarely ever see one. Have not been bitten once this year! I love the orange tango! Cipriano, you are welcome to introduce smoosh into the Canadian vocabulary 😉 Lucky you to not have so many bugs. You should see me waiting for the bus in the morning. I must look like a crazy person standing there waving my arms in the air to keep mosquitoes and gnats away. I must admit the orange tango is pretty. Your garden is coming along so well! The weed battle is never won and rarely even a draw–for me, at least. Especially when you won’t use commercial weed killers and rely mostly on hoeing, digging, and pulling. I have never strained my thumb with books, but weeding can make my right hand useless for a while. Jenclair, thanks! Glad to know I am not the only one who loses the weed battle. If only there were some small animal that would only eat weeds we could set loose in our gardens! Weeding sometimes makes my hands hurt too. In this case though the books at work got to me before the weeds in my garden did. My daughter is working at the college library where we work (we’re lucky enough to be able to hire student workers in the summer) and has been moving sections of books. I think I’ll warn her about thumb straining. The term sounds kind of funny but being reminded when you type definitely sounds like no fun. Jeanne, Oh yes, warn her about the thumbs especially if she is prone to repetitive stress injury. I am but my coworker isn’t and even she sometimes complains of her thumbs hurting when we are working on a big summer shifting project. 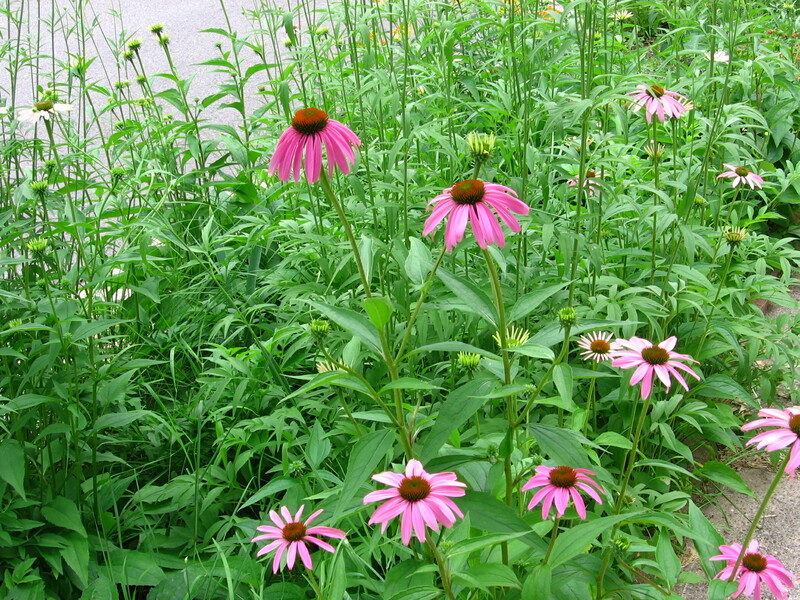 I love coneflowers–yours are so pretty! Did you grow them from seed or have starter plants? I should really try them sometime. As it turns out I only have one container with the usual suspect–petunias! Do you use anything at all on your plants–fertilizer or something to keep the bugs at bay? Your garden is looking so colorful–and yummy! Sorry to hear about your thumbs, but I know all about wanting to grab as many books to get them shelved as possible–ouch, though! Try and stay cool–we are in the same weather pattern only less rain and the same heat and humidity! Danielle, thanks! The purple ones that are starting to bloom I began from seed a very long time ago and they have spread themselves around the garden. 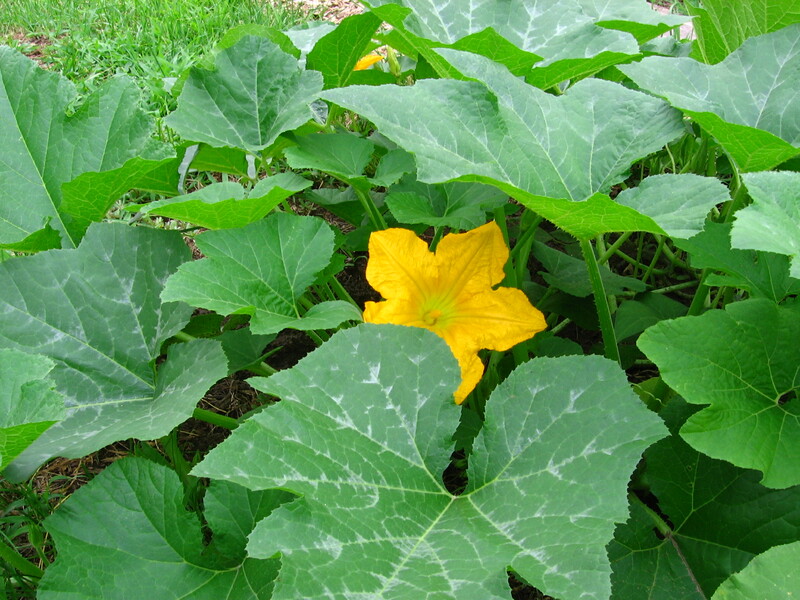 I have a yellow variety that I bought as a plant that is also spreading itself around the garden. I use no fertilizer other than compost from my compost bin. For bugs I pick them off if they are really bad but most of the time I wait them out because some other bug comes along and takes care of them for me. Thumbs are getting better slowly. But the weather! Ack! Heat warnings and a heat index of 100 today. I feel hot even inside in the air conditioning. I am much older than you so you probably don’t remember the variety of bean that was the “string bean” At the edge of the bean there was a “string” that was inedible and therefore had to be pulled off before the bean was cooked. Our modern green beans are much tastier. I enjoy your garden columns. Unfortunately I no longer have space for a garden.